Dog Mountain Farm, located in Snoqualmie Vally near Carnation, Washington, offers summer farm dinner events that are a culinary delight. 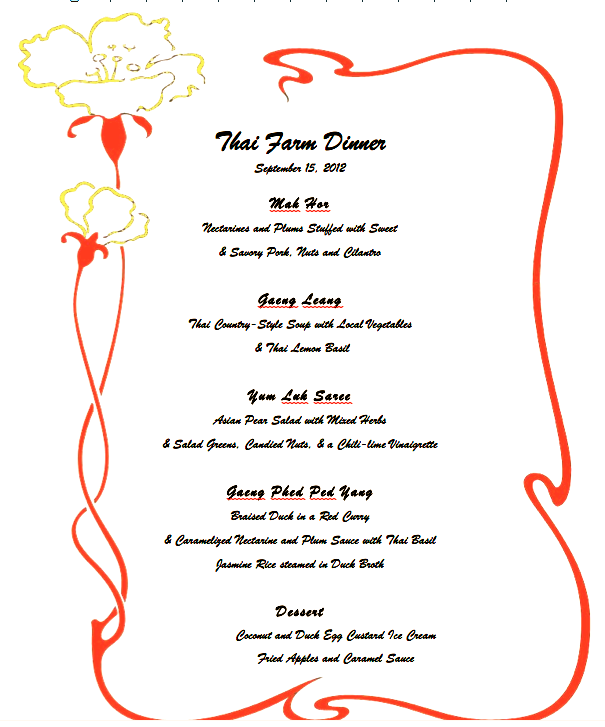 The dinners are prepared by a guest chef and served with wines from a local winery. 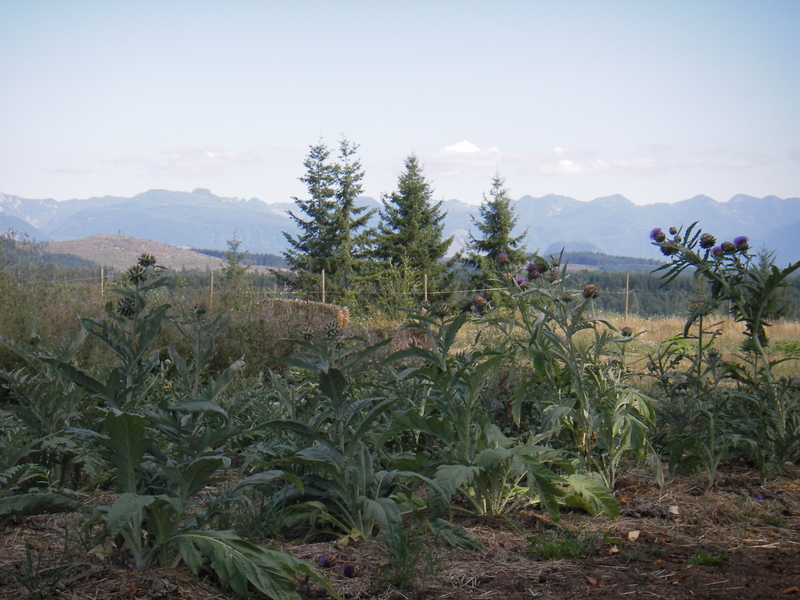 I attended one of these dinners in June 2010 and was blessed to experience a half day at the farm of sun-filled summer, a beautiful view of the Cascade mountains, and dining on white tablecloths surrounded by apple orchards. 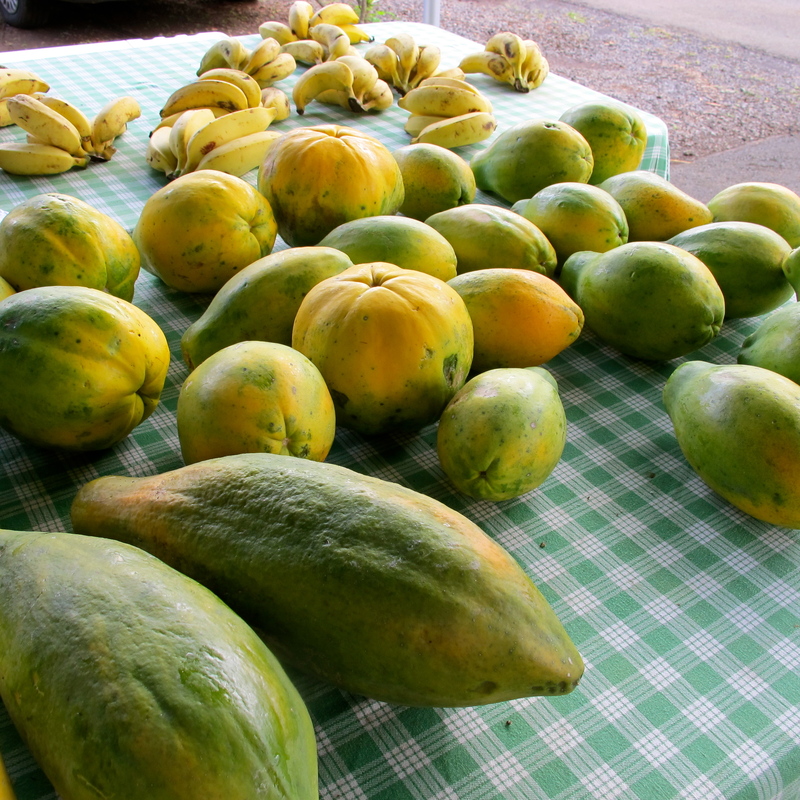 The farm offers various farm and culinary activities year round for all age groups. September 2012 has provided the rare beauty of a long stretch of sunny days. Saturday, September 15th, the date that I cooked at the Dog Mountain Farm, was one of the most beautiful days among them. The farm dinner guests arrived at 3pm. Farm owners Cindy and David welcomed everyone with champagne and an hors d’oeuvre, then took them on a farm tour. I was happy to have the hors d’oeuvre done just in time. 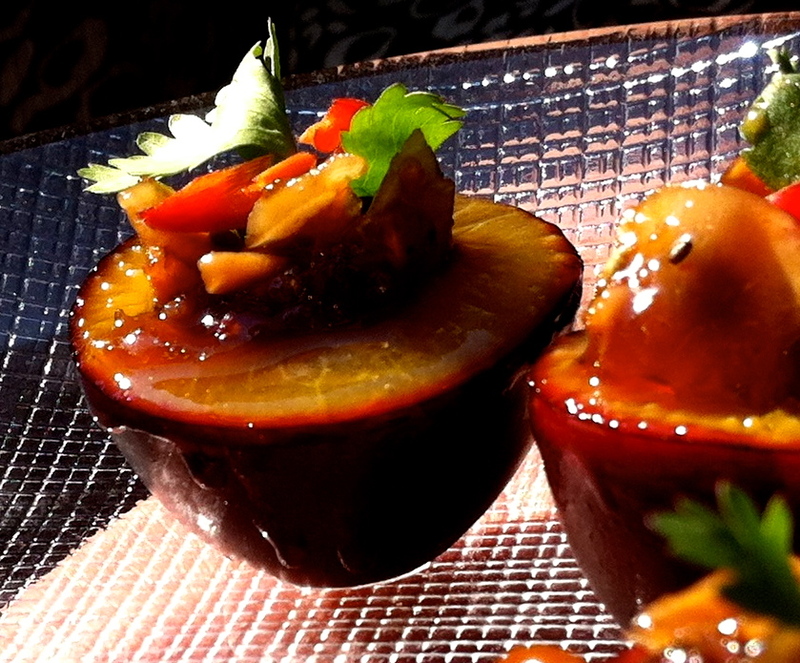 The abundance of plums provided a good substitute for pineapple in the Thai hors d’oeuvre called Mar Hor or Galloping Horse, a savory pork mixture atop plum brûlée. 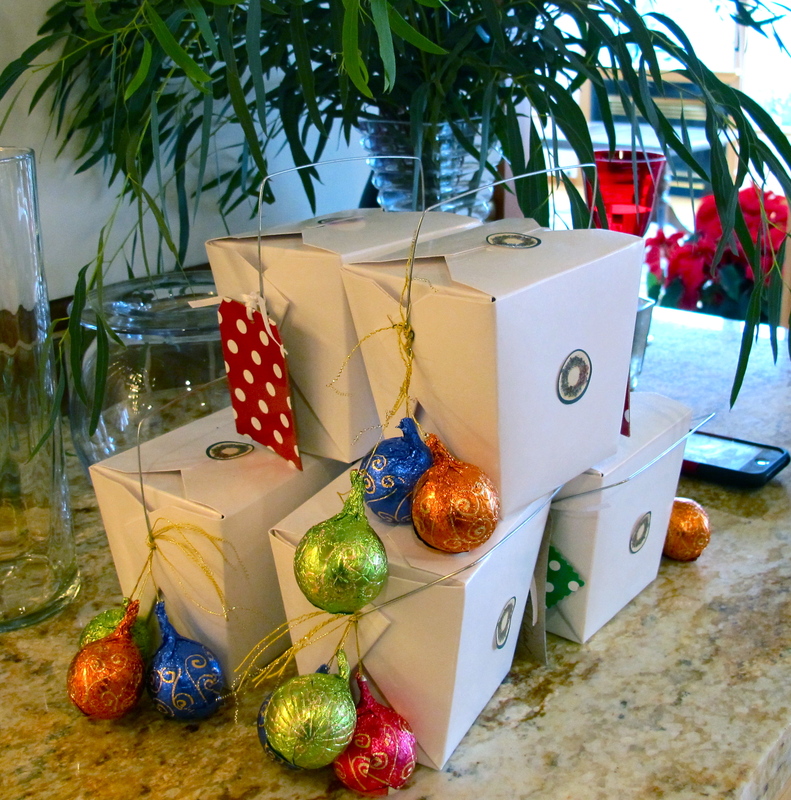 I was pleased when I ate one to hear the excitement of taste from far away – like someone galloping a horse. 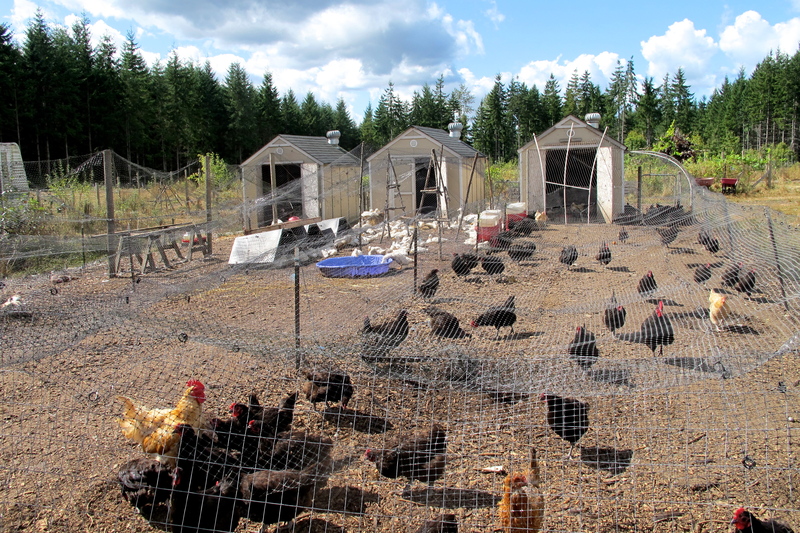 The Dog Mountain Farm raises French Grimaud Pekin and Muscovy ducks, Embden geese, French guinea fowl, and heritage turkeys. 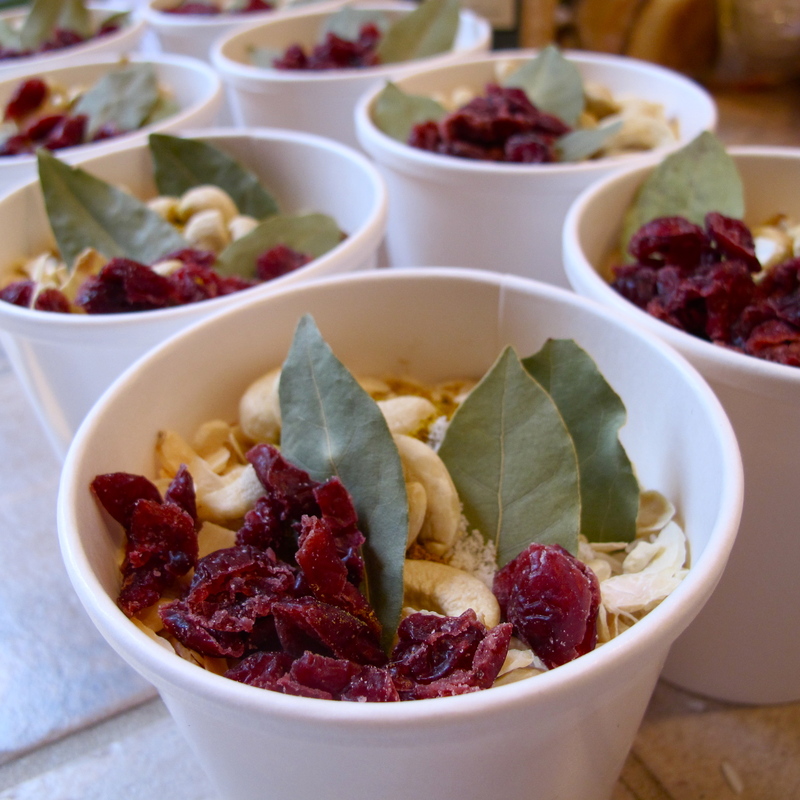 While the guests toured the farm, I continued cooking—there were four more courses coming. My Thai Farm dinner included wine pairings from the Wilridge Winery. The wines were served by the winery’s owner and winemaker, Paul Beveridge. Paul selected the wines exclusively for the menu above. They were Viognier Rosebud Vineyard ($11.89), Estate Nebbiolo Wilridge Vineyard ($210), Estate Sangiovese Wilridge Vineyard ($21), and Estate Mélange Noir Wilridge Vineyard ($21). The amazing wines, along with the details and personal stories that Paul shared, enriched the dinner experience. The dinner was served around 4:30pm and I was able to pause at that point for just a minute to take in the sun rays that filled the farm kitchen. 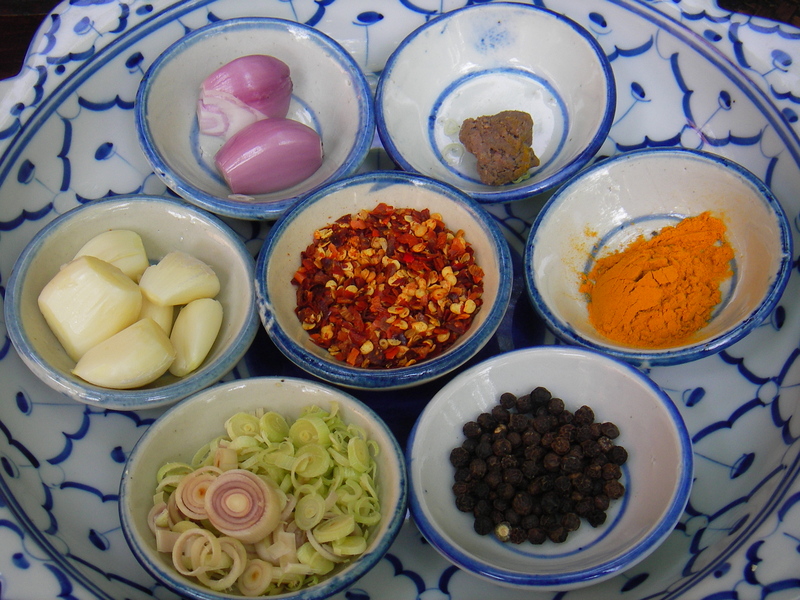 Then I ladled the Gaeng Leang – Thai country-style soup – into individual bowls. 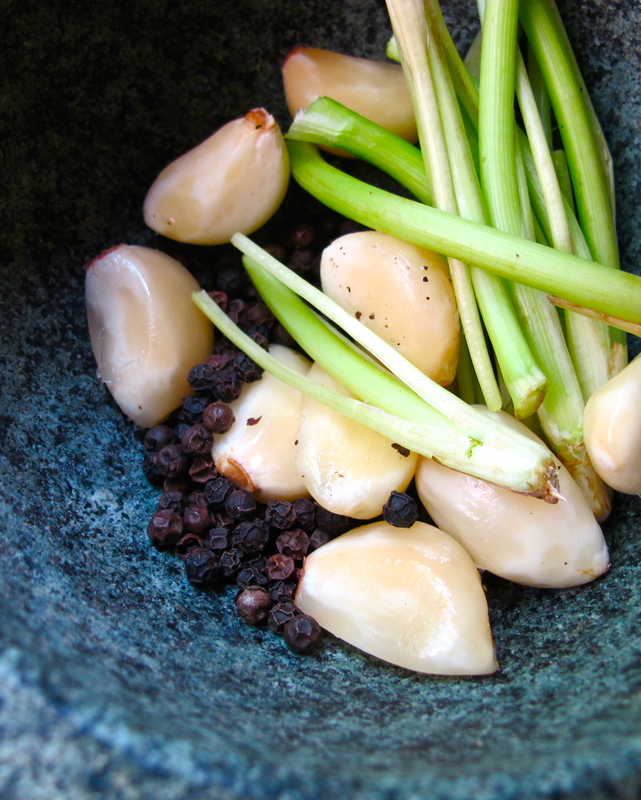 (Please click here for Gaeng Leang Recipe). 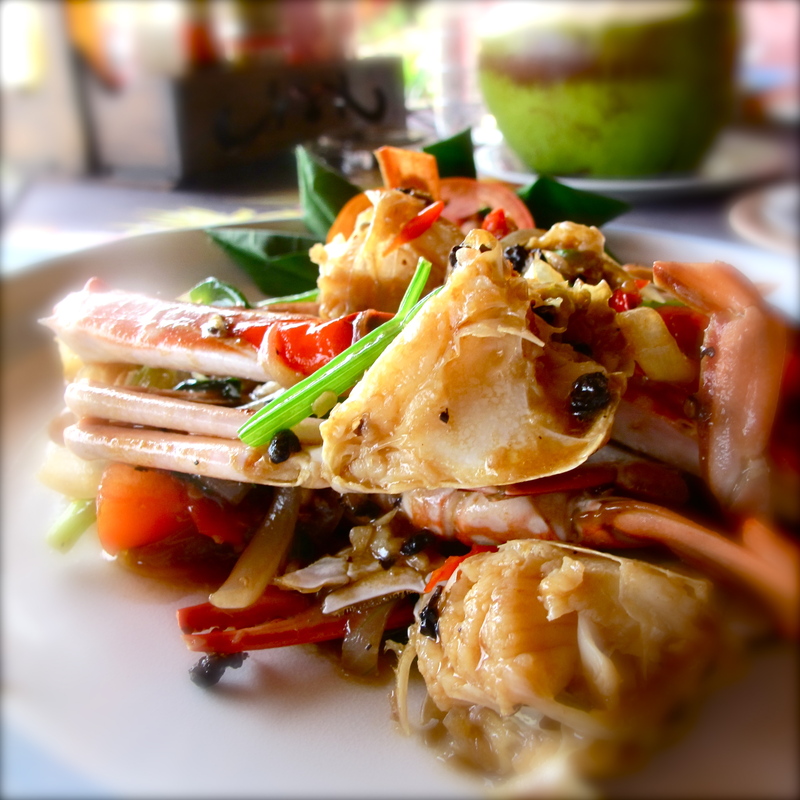 Gaeng Leang is often served at Thai dinners to display local abundance. This one had a generous amount of lemon basil from the farm green house and was as authentic as my grandmother’s cooking 40 years ago! 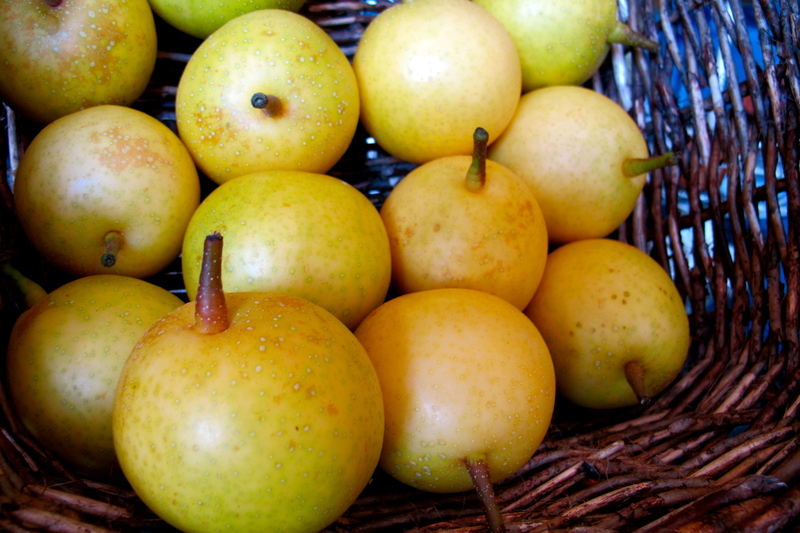 Asian pear is crunchy, juicy, sweet and fragrant. The third course was an Asian pear salad with mixed herbs and salad greens and a sweet chili vinaigrette. I didn’t have a chance to take a picture of the salad or write down the recipe, so I will have to recreate the recipe one day to share with you. This dish was totally impromptu. 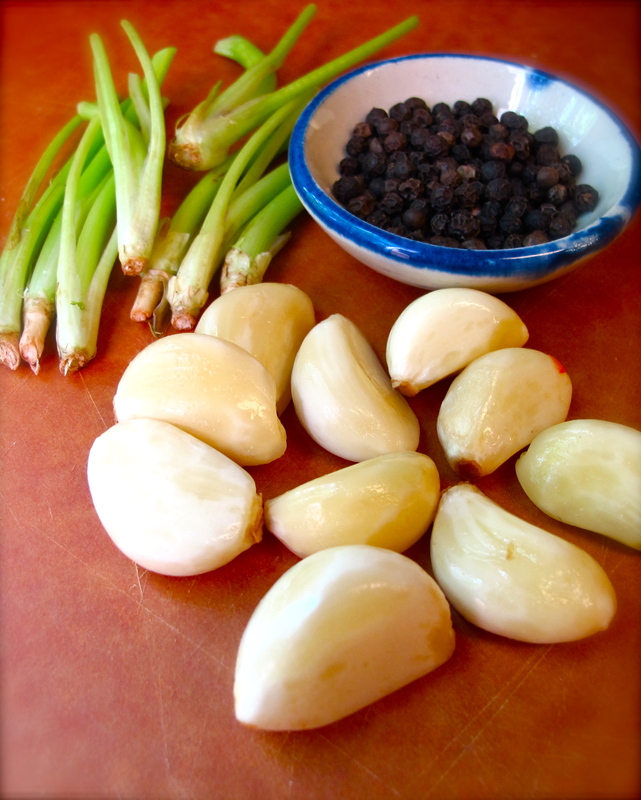 I adjusted my chili lime vinaigrette recipe by adding a few more ingredients to compliment the farm’s Asian pears and to echo the flavors of the overall dinner menu. The fourth course was a traditional Thai duck curry, Gaeng Phed Ped Yang, made with Dog Mountain Farm’s French Grimaud Pekin. 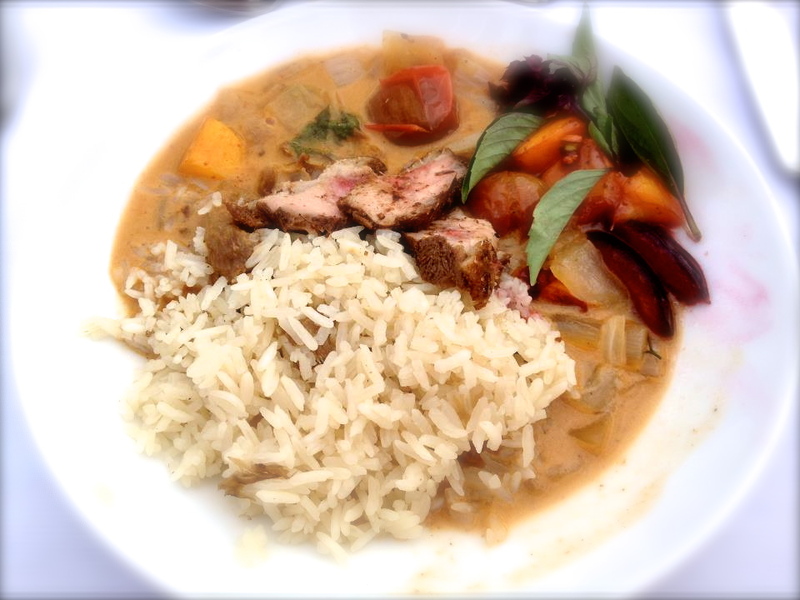 For more information and a recipe for curry dishes please check my future posts. Originally I had planned to make just one dessert: coconut duck egg custard ice cream with fried farm apples. But once I began cooking with the very fresh duck eggs, I could not help but make my mom’s Thai duck egg custard over black sticky rice, a traditional Thai dessert. Once the five-course dinner was served I had a chance to relax, join in the conversation with the dinner guests, and take in the beauty of the double sunset—a beautiful sunset to the West and the reflected light on the Cascade Mountains to the East. For those of you who live in the Seattle area, Dog Mountain Farm has a stand at the Broadway Farmers Market on Sundays. Please check their website and then send them an e-mail to have them harvest fresh produce that you can pick up at the market on Sunday between 11am – 3pm. I have had this Honey-Lime Tea recipe written since last year when my son was sick and missed a week of school with a fever and annoying cough. When it comes to home remedies for coughing, my grandma’s honey-lime tea, which I have had countless times for coughs, that stands out in my memory. It was my son’s tired face on a rainy day in September 2011 that took me to the kitchen here in Seattle to prepare some. It had been a long while since I had made it, but there is nothing difficult at all about this simple three-ingredient recipe made from lime, honey and salt. 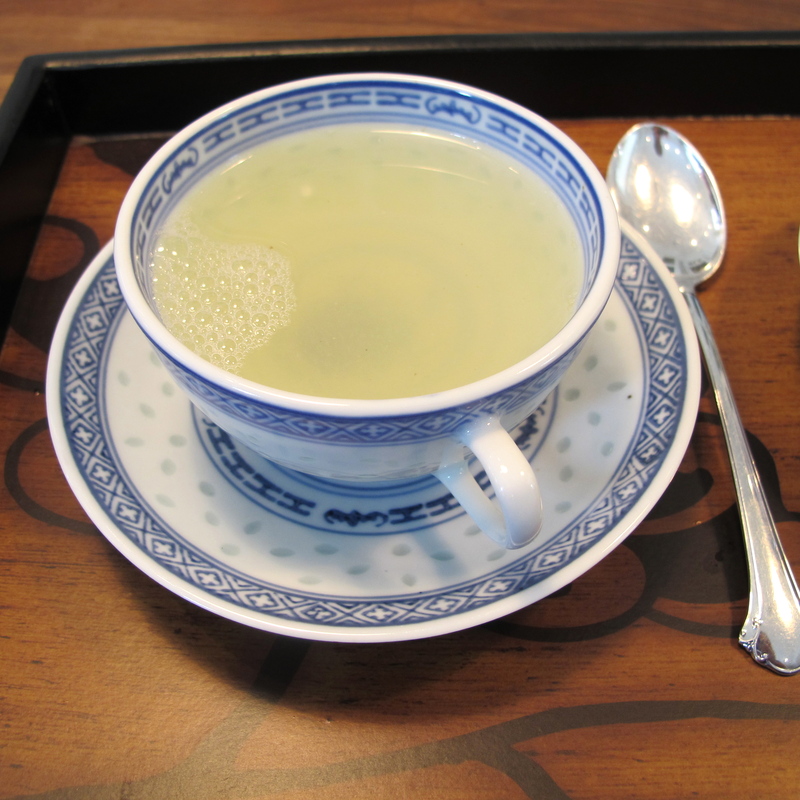 All that’s needed is the right balance of salty, sweet and sour to sooth the aching and irritated throat. 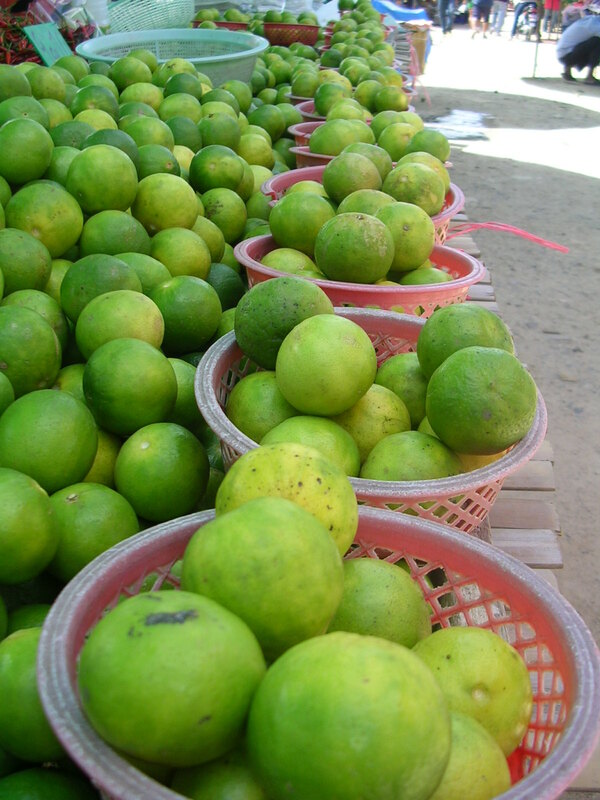 Lime is a great source of Vitamin C and “Honey has also been used for centuries as a treatment for sore throats and coughs and, according to recent research, may be an effective soothing agent for coughs” (from Wikipedia). The risk for honey is only in children under a year of age because of a rare occurrence of infantile botulism, otherwise it is a well-established natural cough remedy in many cultures. In my kitchen, with the honey, limes and salt in front of me, I recalled standing side by side with my grandma in her kitchen, watching her stirring, tasting and adjusting the sour, sweet and salty. The sour from lime would make my eyes squint, but adding enough honey to cut the sharp edge of the lime would allow my eyes to open once again with sweet delight and the mixture to comfort my sore throat. Then she would add enough salt to pronounce its existence and make the honey and lime dance together in harmony. The warmth of the tea also soothed the sore throat. I would sip this tea slowly as if to allow each sip of honey-lime tea to absorb and sooth and melt away all the discomfort. It is not often I get a credit for my home remedies, but my son did find a tremendous comfort from this tea last year. 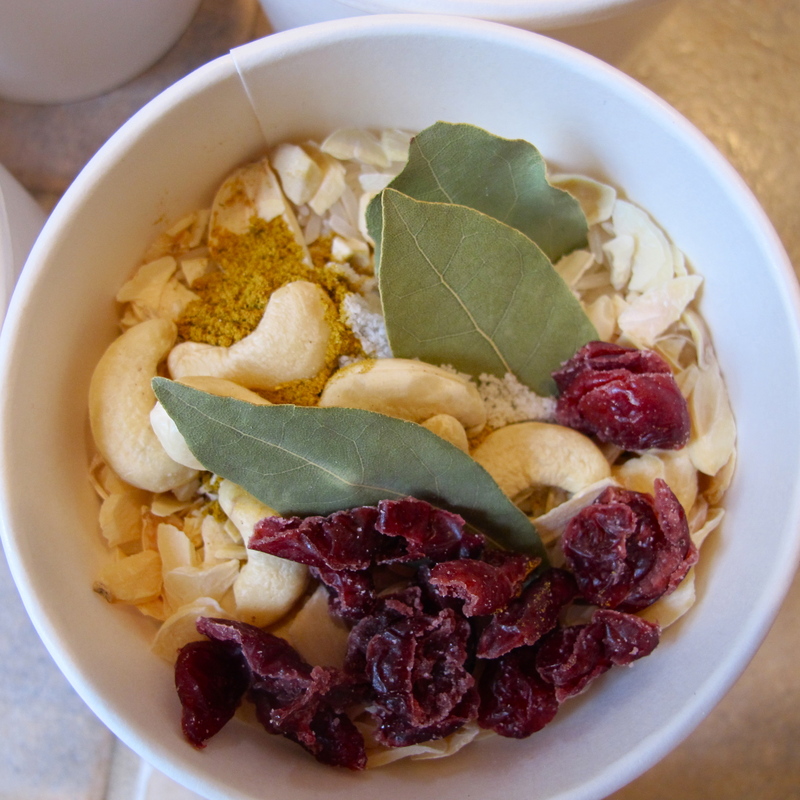 As I tested this recipe one more time, he took part and enjoyed this tea once again, as both of us had mild colds this week. As we sipped, we both agreed that we appreciated this recipe before and now. Don’t judge this recipe by the amount of lime and honey. It is not a tea for daily drinking, but more of a cough remedy for those times that we need all that vitamin C from the lime and the medicinal qualities of the honey. 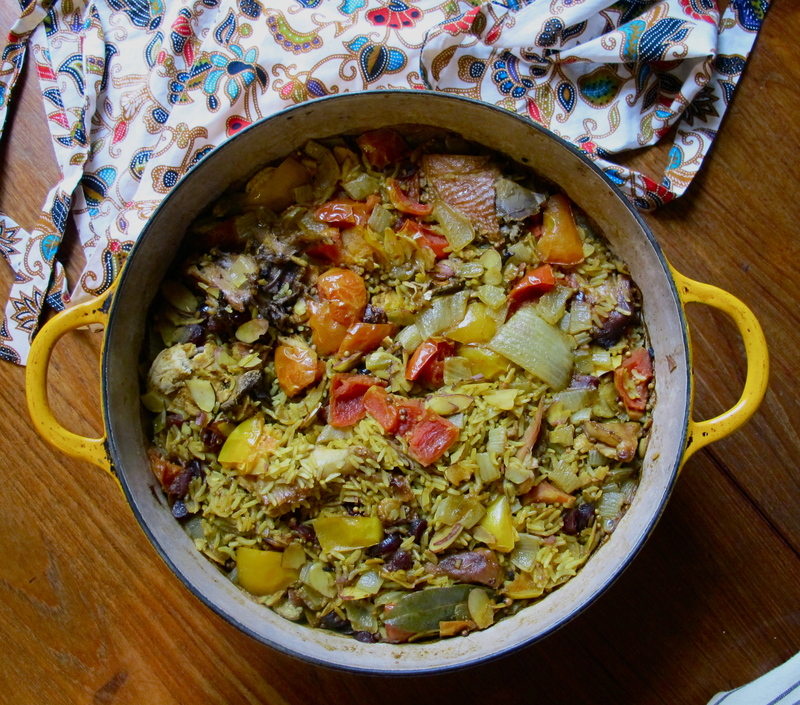 I would recommend that you prepare it according to the recipe and taste it before making any changes or adjustments. Take a good sip and swallow it slowly to allow the warm, well-balanced tea to linger in your throat. 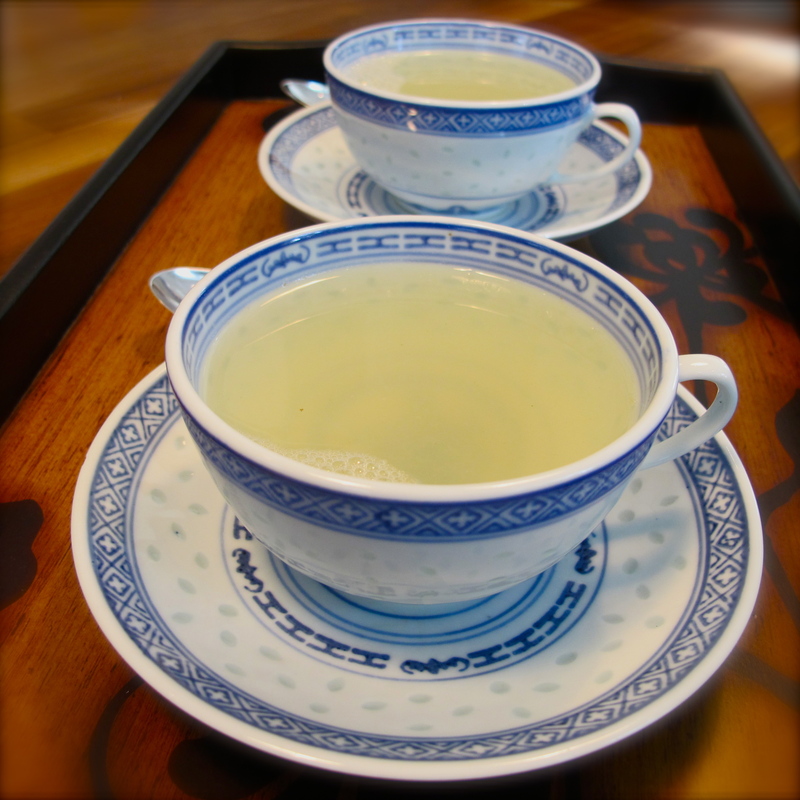 This tea also good for drinking warm just for pleasure, in which case I would reduce the lime juice to 4 tablespoons. I recommend using the full 6 tablespoons of lime juice for use as a cough remedy. Put the water on to heat then prepare the ingredients as follows. 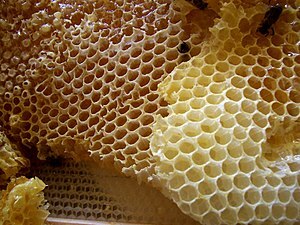 Place salt and honey into a tea-cup and pour boiling water or warm water over it, stirring until the salt and honey dissolve. Add lime juice, stir one more time and serve. For use as a cough remedy, use the whole 6 tablespoons of lime juice and sip it slowly. For tea, use just 4 tablespoons lime juice. This is also an ideal summer drink poured over ice. 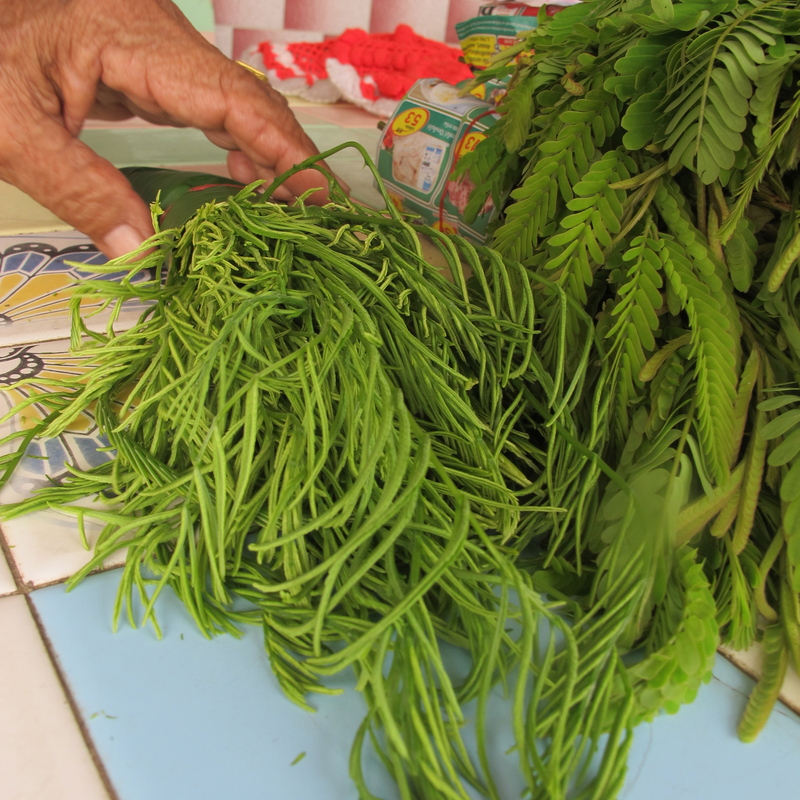 Last week I found fresh acacia leaf, or cha-om, for the first time in Seattle at the Makong Raineir Market. Without hesitation, I grabbed this rare opportunity to purchase some. 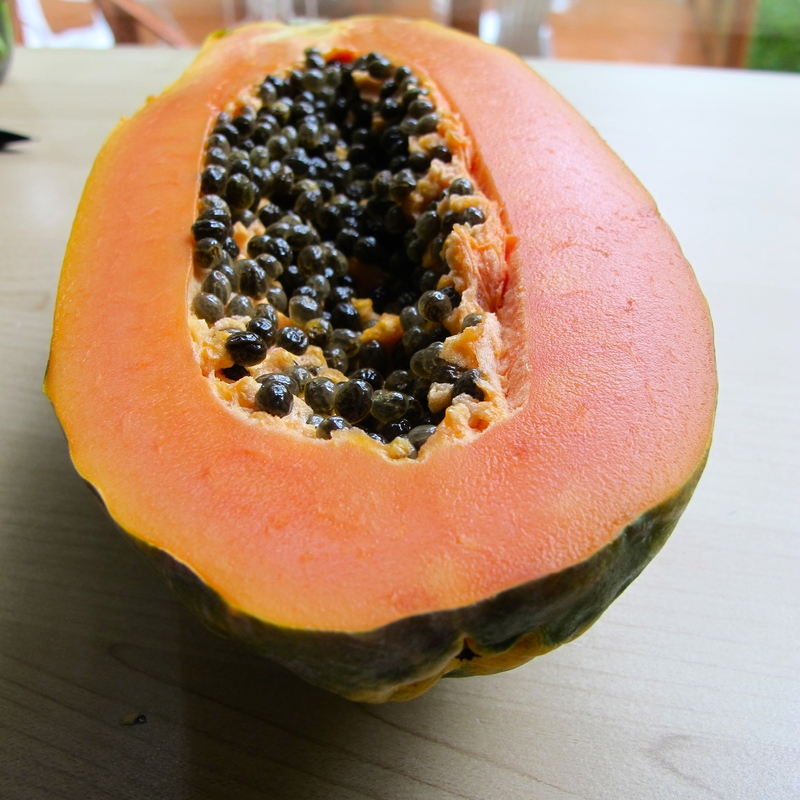 Two days later the cha-om was still fresh in my refrigerator. 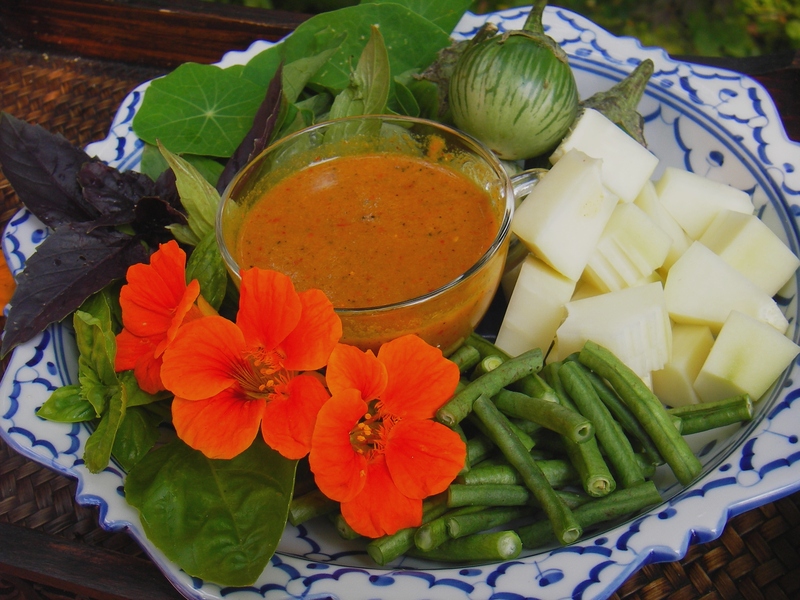 There are many ways to prepare cha-om in rustic Thai cooking (see pictures below), but my heart was set on my favorite cha-om omelet—Khai Jeow Cha-Om—which is dense with a layer of cha-om leaf. 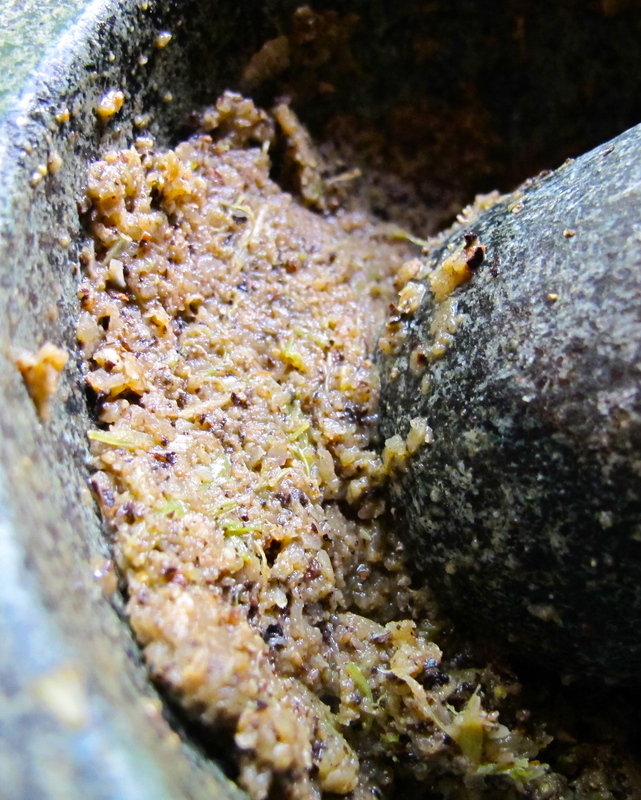 It can be cut into 1-inch squares and served as a side dish or as an accompaniment to Shrimp Paste Chili Dip – Nam Prik Kapi (see the video of my sister and I preparing Nam Prik Kapi). I prepared a cha-om omelet last Sunday and packed it in a tiffin (a stainless steel food carrier), along with warmed jasmine rice and shrimp paste chili dip. Then I took it to a Thai community potluck party and I am happy to tell you that it was gone in the blink of an eye. 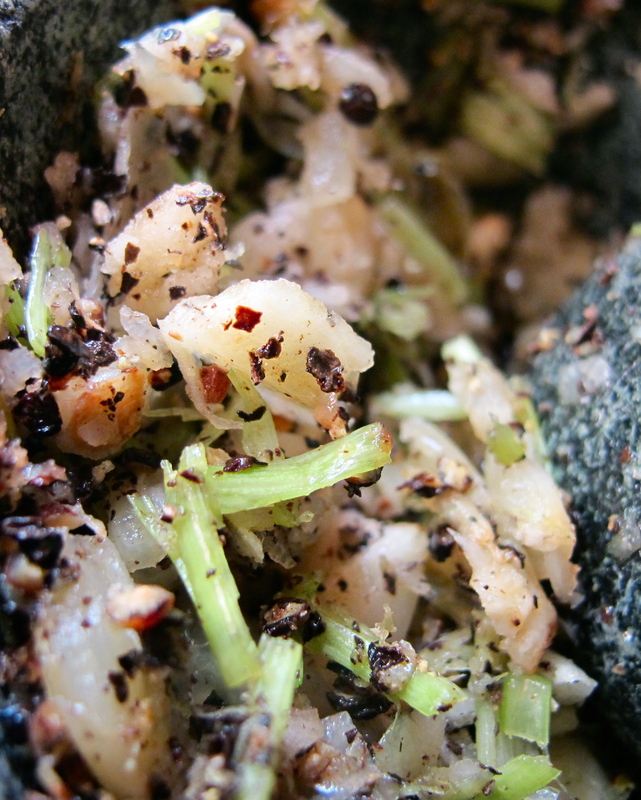 We all love these stinky leaf omelets—a taste of our Thai villages. 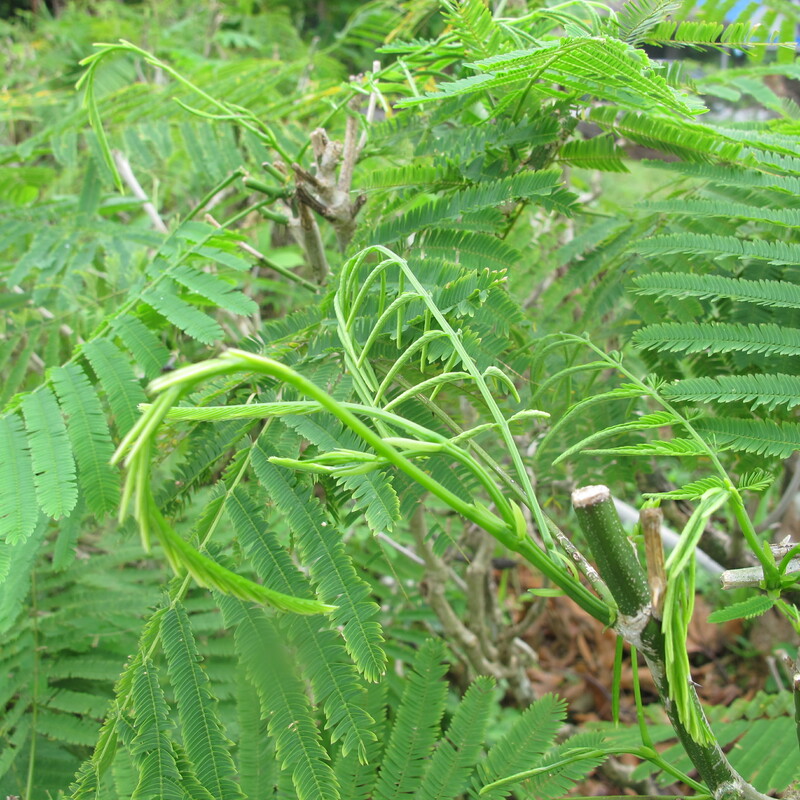 Cha-Om (ชะอม ), or Acacia Pennata, is a shrub that is native to South and Southeast Asia. 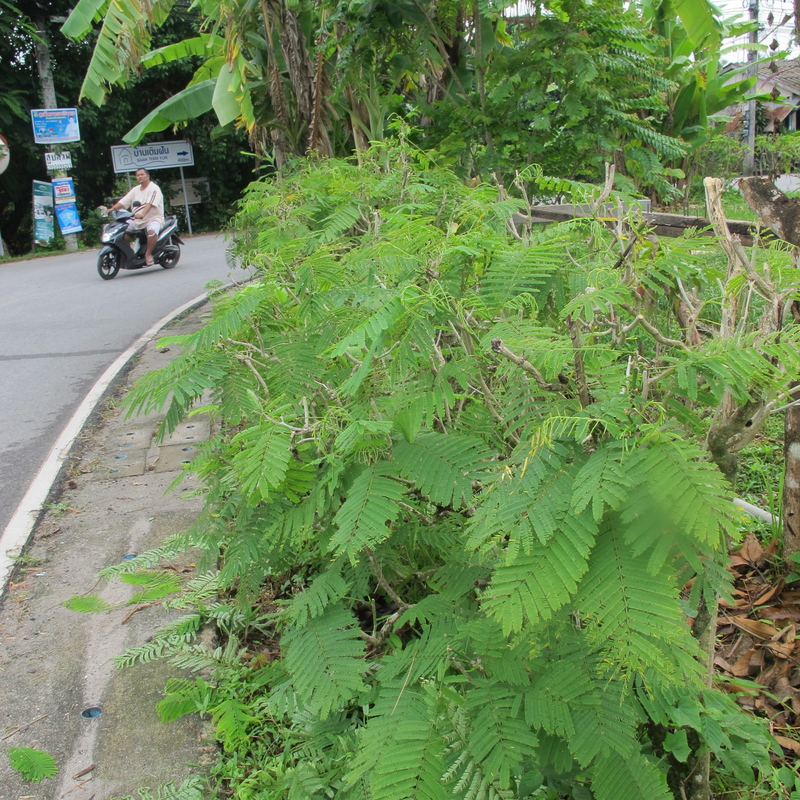 It can grow up to 5 meters tall, but in Thailand we usually let it grow to about 2 meters, then cut it down to promote young leaves. 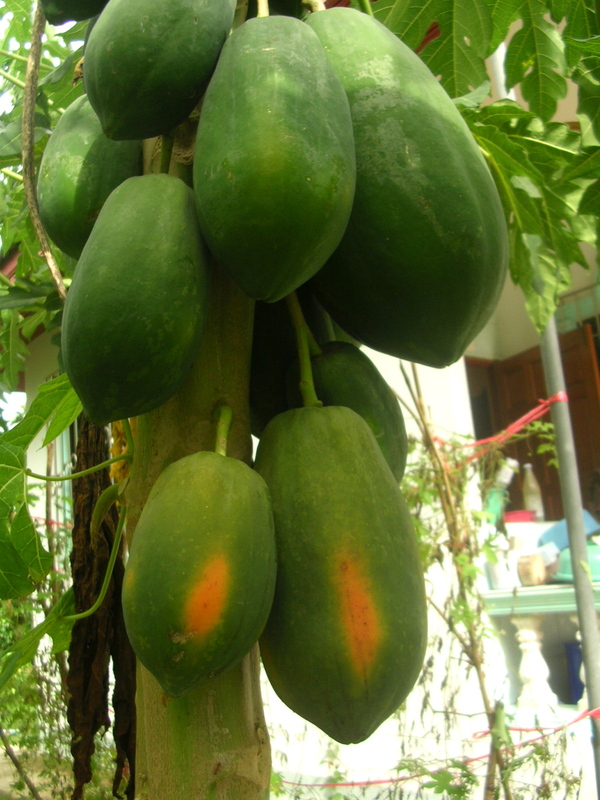 Most villagers love to grow a few cha-om plants in their backyard. I am glad to share with you photos of my friend Nongnut’s cha-om plants. 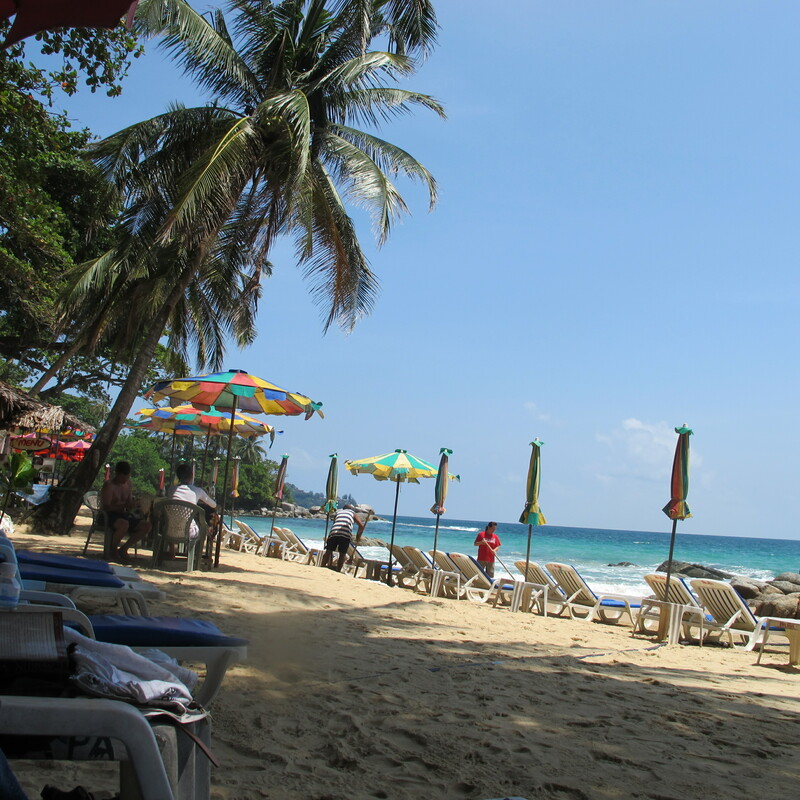 I took them a few months ago while wandering in my village in Phuket. Every week Nongnut’s mom would cut off the young leaves and bundle them up to sell in the morning in front of their house. The bundles would lie alongside the many other edible vegetables from their plantation such as bamboo shoots and young banana trunk. This is a very common practice in Thai villages. It keeps her parents active, they share daily dialogs with friends in the village, and they earn some money selling these nutritious, organic vegetables to villagers. Typically one bunch of cha-om leaves weighs about six ounces; after removing the hard stems, it will yield about two cups of leaves. 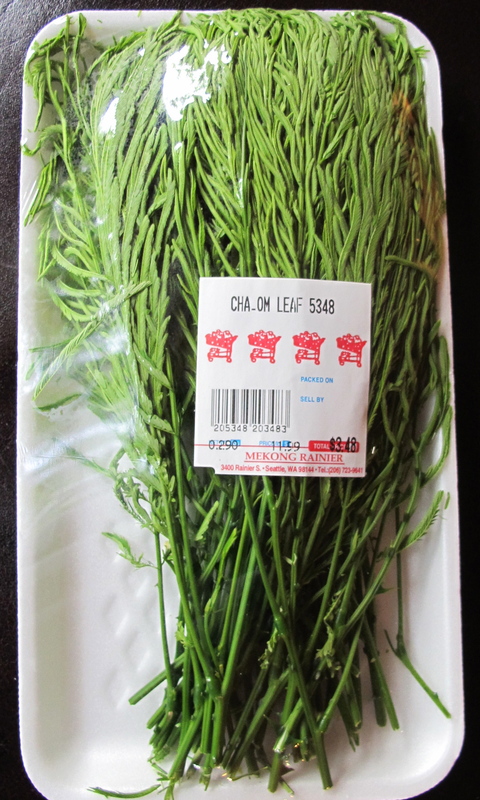 Frozen cha-om leaf is available in Asian markets in the US all year round. Cha-Om omelet cut into square chunks adds a delicious layer of flavor to the traditional Thai sour curry Gaeng Som Goong Cha-Om. In Seattle, the only place I know that serves this dish is the Krua Thai Family Restaurant in University Village. 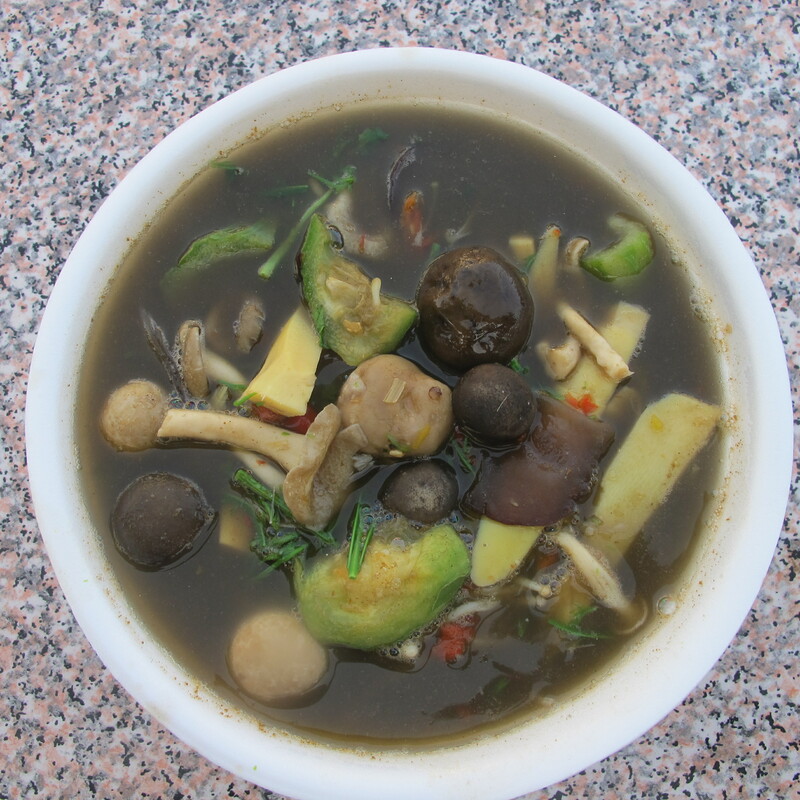 In Northeastern Thailand, cha-om is used in the famous Tom Laos Soup. 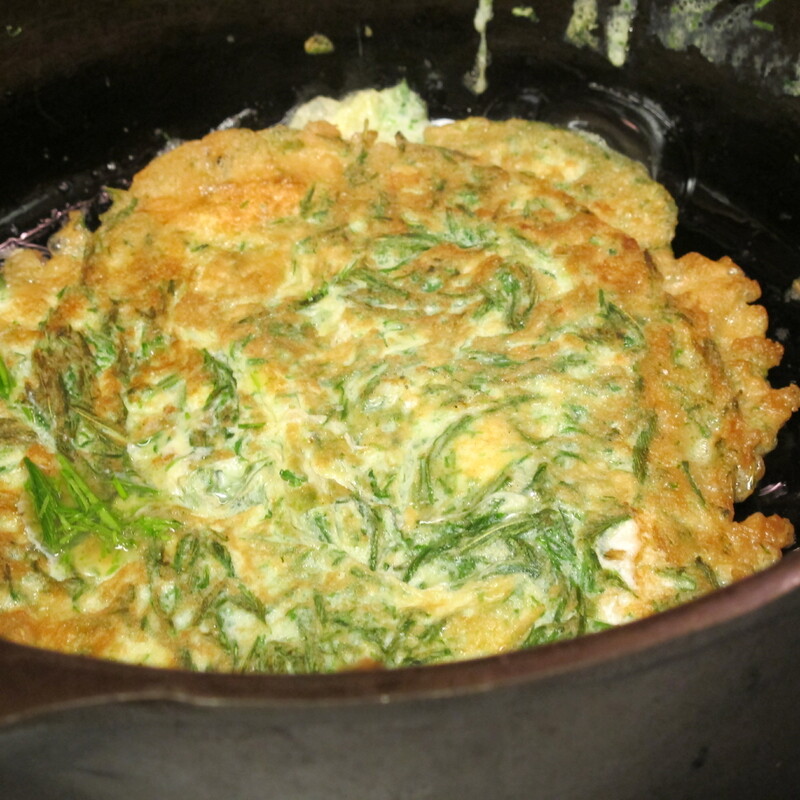 Simply whisk cha-om leaves, egg, salt and fish sauce together to create an egg mixture for Acacia Omelet, or Khai Jeow Cha-Om, a rustic dish of Thailand. There is no substitute for acacia or cha-om leaf, but this recipe can be adapted by using baby spinach for a quick, easy and healthy meal. 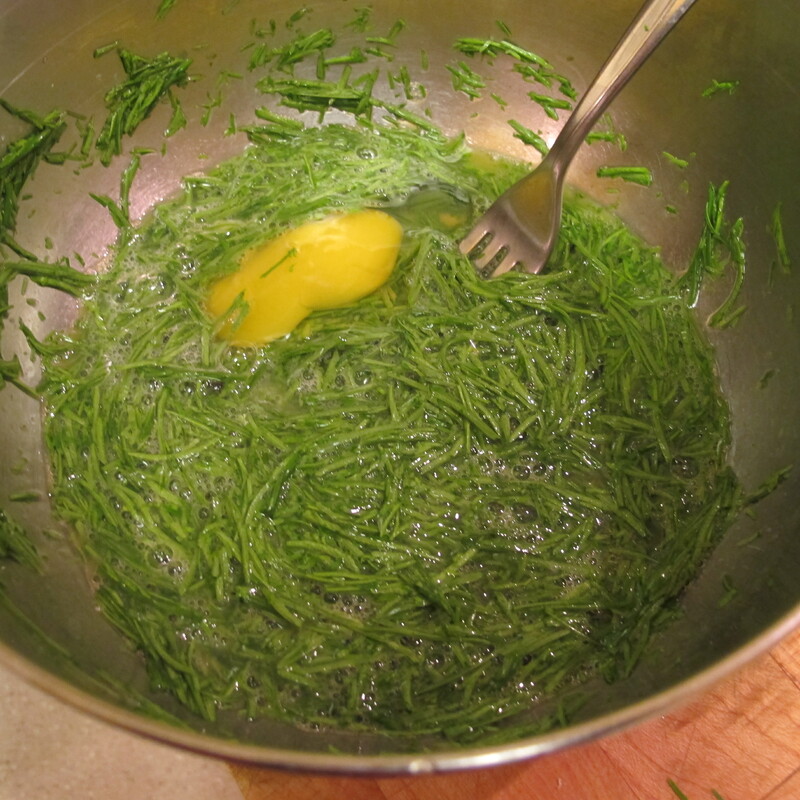 Place acacia leaves, eggs, salt and fish sauce in a large bowl and whisk with folk until mixed, about 1 minute. Heat a large pan on medium-high heat and cover the whole surface with half of the canola oil. Pour in half of the egg mixture and tilt the pan to make an even layer of omelet; let it cook until golden yellow on the bottom, about 3 minutes. Flip it and cook until the other side is also golden yellow, about 2 minutes. Remove with spatula to a serving plate. Repeat the same process with the remaining cooking oil and the rest of egg mixture. Cut the omelet into small squares about 1-inch by 1-inch and place in a serving plate to serve as a side dish with Thai chili dip or any curry. 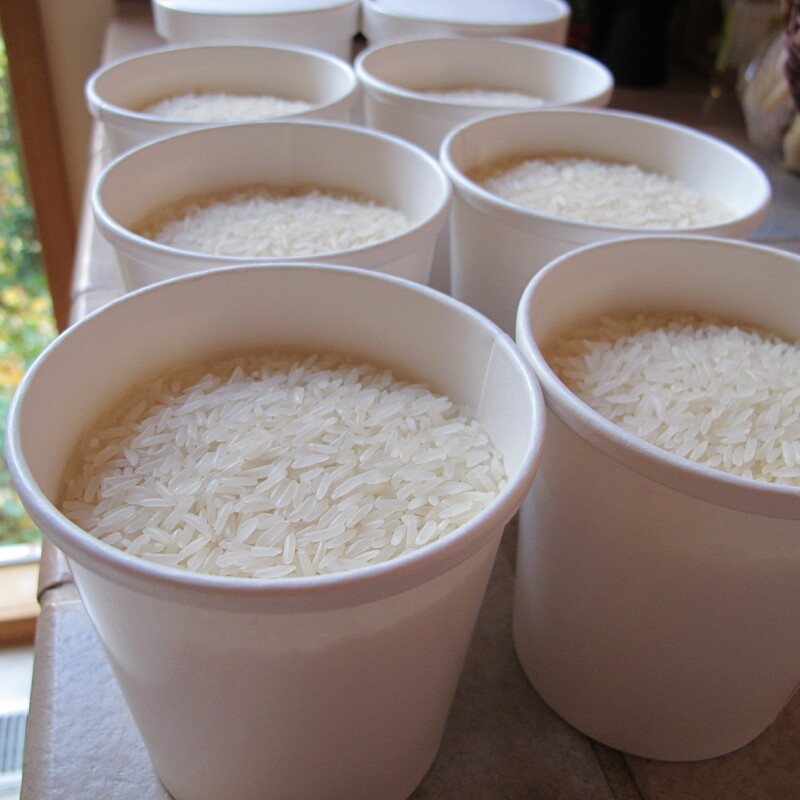 In the Seattle area you can find cha-om in the freezer section at the Mekong Rainier Market or the Vietwah Market. Please click here to find the addresses for these stores.